Designed by Vincent Van Duysen, the VVD kitchen reinterprets recessed handle details in a modern and sophisticated way. The system consists of alternating materials, worktop islands, and stone sink bowls. Glass doors and soft-closing micro-hinges are also available. Once upon a time, the kitchen and bath were utilitarian spaces. The rooms were important, but they were largely hidden and got the short end of the design stick. Times have changed. Today, the two rooms are the most important. The kitchen is frequently an extension—or at the center—of the main living space, visible for all visitors to see. And bathrooms are much more than places to wash up. It makes sense, then, that the products and materials that go into these rooms be cutting edge, attractive, and durable. And the products and materials that construction professionals choose these days are likely to be modern or contemporary. In its 2017 Kitchen & Bath Design Trends Report, the National Kitchen & Bath Association (NKBA) concluded that contemporary-styled kitchens have overtaken traditional to become the second most popular in North American kitchen design. The other styles that are emerging, NKBA says, are industrial, Mid-Century Modern, and mountain modern. Bath trends to keep in mind include painted cabinets in such colors as gray, blue, and black; furniture-look pieces; rollouts and pullouts; under-cabinet LED lighting; and accessible and universal design features. Builders and remodelers should consider universal design products and features as well. According to Home Innovation Research Labs, the trend is hot among Baby Boomers and in multigenerational households. “Boomers often design with their aging parents in mind, who may join the household when they are less able to care for themselves,” Home Innovation says in a kitchen and bath trend report. Other options construction pros should be considering are natural stone surfaces (and their quartz look-alike alternatives); undermount sinks; ceramic tile and natural stone tile flooring; and low-flow fixtures, Home Innovation says. Our cover story this month highlights many of these trends, but it also brings a wealth of stylish and innovative products to fit your projects. -N.F.M. 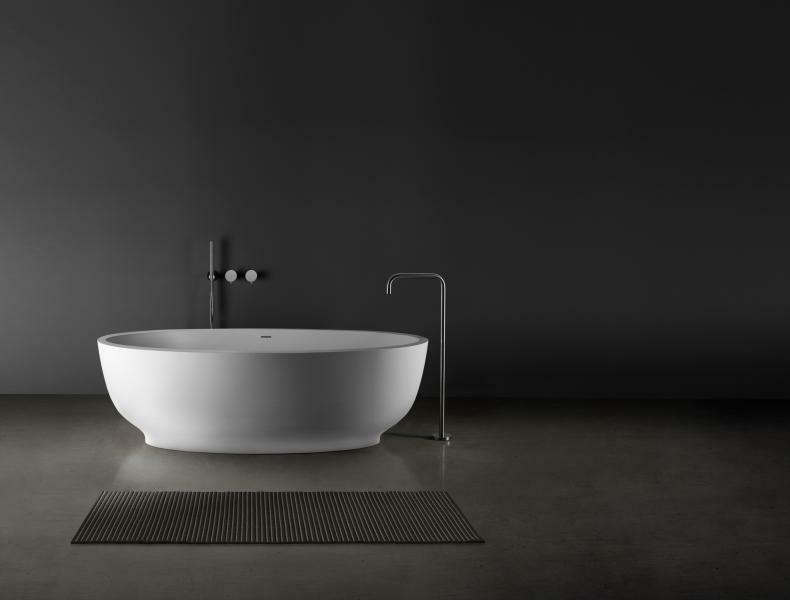 Measuring 68¾ inches long and 31½ inches wide, the fini·1 freestanding bathtub is designed with curvature at the base that provides subtle definition. The one-piece blu•stone unit has a center drain and a matching cover for a streamlined look. 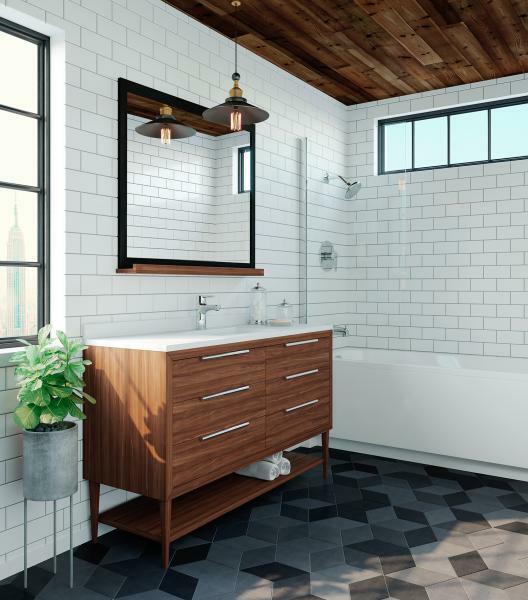 Nearly 600 members of the National Kitchen & Bath Association (NKBA) weighed in on trends, and the verdict is in: Contemporary and transitional design are on the rise in kitchens and baths. One indicator of the growing contemporary aesthetic is a preference for minimalist cabinet door styles. “In general, I think people’s lifestyles are getting busier and, as a response, there is a search for simplicity that is refl ected in tastes around personal space,” says Suchi Reddy, principal of New York-based Reddymade Architecture and Design. Other prevalent modern bath elements include undermount sinks; no-threshold showers; and concealing power outlets within vanities. Hiding outlets and tech features are a bit niche, but they’re gaining ground. “Technology is a big part of the rise of contemporary and transitional aesthetics,” explains Elle H-Millard , industry relations manager for NKBA. “Homeowners are adapting to the latest technology in both kitchens and baths, and both lend to cleaner lines.” —S.K. The Pfirst Modern bath collection is a singlehandle faucet and shower trim that offers contemporary style at an affordable price point. Available in polished chrome and brushed nickel, it’s equipped with an integral temperature limit stop, ceramic disc valve, and push-and-seal drain. Contemporary design is surging in the bath, but which colors complement the style? According to the NKBA 2017 trend report, white, off-white, and gray dominate. The report reveals that blues are emerging, with younger designers opting for violet and purple tones. “As the spa bathroom trend continues due to people caring more about the bathroom experience in general, colors like soft blues, greens, and violets translate really well—they invoke a sense of calmness,” says Sue Wadden, director of color marketing at Sherwin-Williams. Gold and brushed brass are gaining ground when it comes to faucets, leading Wadden to believe that “deeper, darker hues in the bathroom are going to emerge. The combination of dark walls and golden and copper metals are really moving in, and the look is beautiful for the bathroom.” —S.K. Scava is an oak veneer kitchen cabinet set with handles incorporated into the fronts. 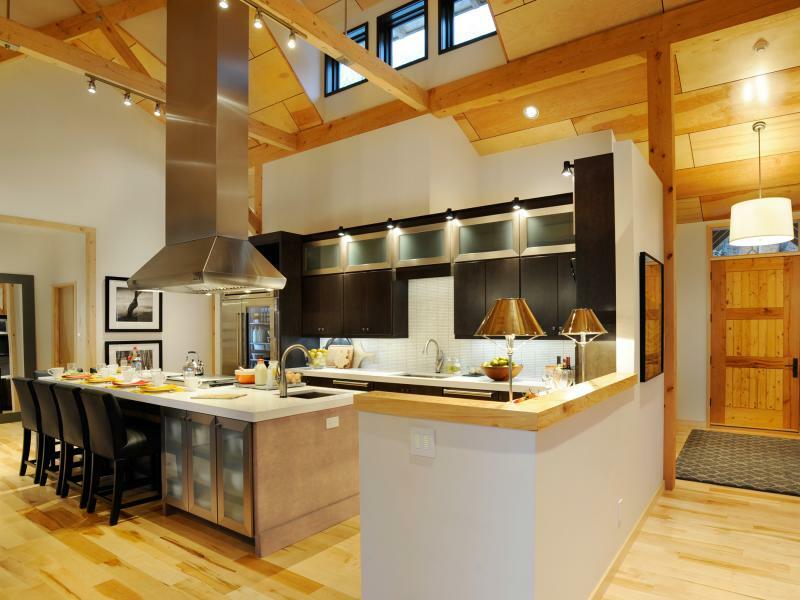 The kitchen features columns in brushed steel, and an island in Rovere Silver oak wood. A variety of surfaces are available. Click here for bonus Blippar content. The materials and colors dominating the cooking space are a lot of the usual suspects. White and gray are still among the hottest colors for cabinetry, but blue, black, and high-gloss are emerging. “We have certainly had requests for white and gray, and for high-gloss fi nishes, which is an interesting high-end traditional element re-emerging in the modern kitchen,” says Reddymade Architecture and Design Principal Suchi Reddy. The NKBA trend report says two-toned kitchens are on the rise as well. Similar to the two-color trend, there’s more mixing and matching of materials for various kitchen surfaces and accents. In particular, rustic and reclaimed woods are becoming more desirable. When talking stone countertops, NKBA states quartz is still tops. “Quartz offers a beautiful aesthetic and a durable surface that homeowners fi nd appealing. Lower maintenance is key for our busy lifestyles,” explains Elle H-Millard, industry relations manager for NKBA. Compact sintered surfaces are also getting noticed. “We are seeing monolithic materials such as Neolith, which come in large formats, becoming popular among our clients,” Reddy says. —S.K. Part of the company’s Estate and Premier lines, these cabinets are among the brand’s best offerings. Details include cope-and-tenon construction, a 1/2- or 5/8-inch plywood back, six-way adjustable soft-close hinges, and 3/4-inch solid hardwood drawers with dovetail joints. A decade ago, the late architect Michael Graves raised awareness that designers could lead the way in improving accessibility. The movement may have started out slow, but universal design is now a hot topic. According to the NKBA 2017 Design Trends Report, universal design is on the uptick in kitchens and baths. A quick survey of the market shows a breadth of products and solutions that address limited mobility or ADA compliance, from magnetically attached handheld showers to French-door ovens. “The extra mindfulness won’t cost more, it will just provide a more effective design solution,” says Sacramento, Calif.-based interior designer and Certifi ed Aging in Place Specialist Kerrie Kelly. Knee space in a bathroom, she explains, can accommodate wheelchairs but also makeup application; a shower bench can become a leg-shaving shelf; and roll-out shelves in kitchen base cabinets keep everything within reach. Kelly advises retrofitting some or all kitchen cabinets to include rollout components, varied countertop heights, and two-tier pull-down systems. In the bathroom, Kelly points to barrier-free showers that result in sleeker, streamlined washrooms; lever faucets that are easy to operate for persons with arthritis; and adjustable showerheads. —S.K. This story originally ran in the Nov/Dec 2017 issue of PRODUCTS magazine. See the print version here. Click here for more information about this issue's bonus Blippar content. The Croma Select E 180 is an all-in-one shower solution that can be easily installed and maintained. It comes with the Croma Select E 180 showerhead and a Croma Select E 110 handshower. The manufacturer has collaborated with designer Marc Newson on a line of linear decorative drains that draws inspiration from the Hex wood table and interiors of the Lever House Restaurant in New York. It comes in five finishes. Measuring 30 inches wide, the Professional single wall oven offers convection baking, a temperature probe, and a PowerPlus No Preheat feature that eliminates the need for preheating. It comes in smudge-proof stainless steel. This combination 14-inch shower shelf is designed to hold personal shower products as well as bar soap. Made from solid brass, the product comes with installation hardware and is available in polished chrome and satin nickel. The Decibel lav faucet was inspired by classic record players. It has metal knob-style handles and a metal valve, and flows at a rate of 1.2 gallons per minute. It comes in chrome, nickel, and graphite finishes. Quattro.Zero is a new line of bath products with thin walls measuring 8 millimeters thick. Made from Ceramilux SSL, the tub is able to retain the warmth of the water temperature longer than other materials of greater thickness. This 30-inch wine cooler features a dual-zone system, full-extension racks, and LED lighting. Able to hold 150 bottles, it can be ordered with three custom fi nish colors, and copper, brass, and chrome hardware options. This combo drawer unit features a refrigerator top drawer and freezer bottom drawer and ice maker. Other features include LEDs, SoftClose hinges, and a 24-inch depth. The manufacturer says this wall oven is the perfect solution when 220V electric is not an option. The 30-inch, 110-volt built-in unit requires 20 amps of service, has electronic controls, eight cooking functions, and a convection fan. Wave Gourmet is a large, functional island made with a 5-millimeter-thick solid stainless steel top, while the cabinets are covered with metalized paint. It comes with a wood butcher block section. This four-door refrigerator boasts 28 cubic feet of capacity and a 21½-inch connected touchscreen to stream music, videos, or Samsung TV. Three interior cameras show refrigerator contents without opening the door, and a Family Hub command center lets homeowners share multiple calendars, photos, notes, and memos from mobile devices, create shopping lists, or control temperature zones remotely. Luv is a new collection of Scandinavian-inspired products that includes washbasins, bathtubs, and bathroom furniture. Shown here with the Luv above-counter basin, the furniture piece has heightadjustable feet, one or two push-toopen drawers, and self-closing functionality. Various colors are available. Click here for bonus Blippar content. The Frame Collection takes inspiration from Japanese architecture, creating an elegant and practical line of vanities and mirrored cabinets. Panels can mix and match eight eco-friendly finishes, as well as LED lighting, mirror defoggers, and flush-mounted electrical outlets. Click here for bonus Blippar content. A collaboration with architect David Rockwell of the Rockwell Group, the Inciso Collection of bath fittings and accessories offers a clean, modern aesthetic and highly customizable specification. Products are made from solid brass and come in a variety of finishes, including black, nickel, and bronze. Click here for bonus Blippar content. The Ceraline channel drain features a sleek design and a patented adjustment system that ensures flush installation. It comes in three trim styles and six finishes. The WhisperValue 80-CFM bathroom fan is suitable for both single-family and multifamily homes. A slim, 3⅜-inch housing depth fi ts within a 2-inch-by-4-inch stud bay. The Energy Star-rated fan is quiet and effi cient, the company says, and an L-shaped bracket allows for flexible installation. The Exeter bar pull features a modern yet familiar silhouette that is at home in any style kitchen. Each piece starts with a basic bar pull shape and then bends to attach to cabinetry. It comes in six lengths. The 66-inch Laurel freestanding tub features a high, broad backrest that allows bathers to recline fully. Made from cast acrylic, it’s structurally reinforced with fiberglass and mounted on a stainless steel frame. Click here for bonus Blippar content. The smart French door refrigerator features 32 cubic feet of storage space and has a pantry-inspired layout with a shelving system that is easy to access. Able to store 30 percent more than a comparable unit, it has an infinity shelf that slides back for extra room. The redesigned Richmond II toilet now features a skirted bottom, a transitional style, and a teardrop lever. Flushing with 1.28 gallons per flush, it has an elongated bowl, a one-piece design, and a fully glazed trapway. The sleek Minta faucet features a swivel spout with either a C-, U-, or L-shaped neck. The tall, tubular body features a pull-out aerator or pull-out spray and is available in chrome or stainless steel. It is also equipped with water-saving EcoJoy technology. Click here for bonus Blippar content. This surfacing is made from recycled glass, Portland cement, and non-toxic pigments. Available in classic neutrals to jewel tone colors, slabs measure 52 1/2 inches wide, 96 1/2 inches long, and 1 1/4 inches thick. Part of the Tailored line, the Jute vanity is a Mid-Century Modern product that features frameless construction, solid wood and veneers, and full-overlay doors and drawers. It comes in various configurations. Part of the Modernist Collection, the Pro Dual-Fuel Range offers steam roasting and steam baking, 22,000-BTU burners, and illuminated knobs. Products also feature TechCraft—the fusion of craftsmanship, provocative design features, and technology such as Wi-Fi connectivity. 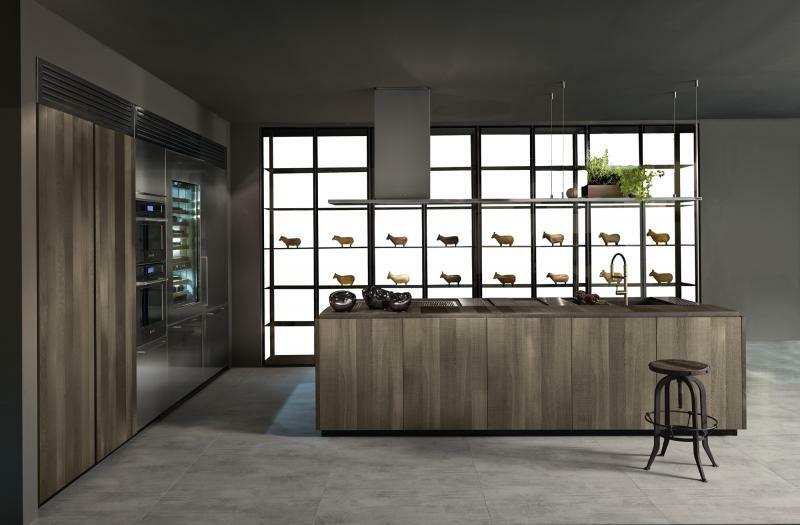 The Emetrica kitchen features shadow oak tall units, a wine cellar, and an island. The nested drawers have anthracite gray internal sections and dark oak fi ttings, while the countertop and undermount sink are volcano quartz. Hello, does this come with a moisture detector? Hi Victoria, which product are you referring to?